You want to grow your agency and provide exceptional services to your clients. We'll give you an unfair advantage with our software, training, and support. Become a partner Partner with HubSpot to power your agency's growth. HubSpot’s Agency Partner Program will transform the way you and your clients market and sell. A modern marketing methodology. All-in-one software. Exclusive agency partner tools and resources. With HubSpot’s help, there’s no limit to how much you can scale your agency’s growth and lead your clients down a path to success. HubSpot’s Agency Partner Program is for agencies that want to grow their businesses by providing exceptional inbound marketing and sales services to their clients. As a HubSpot partner, we increased our monthly recurring revenue by 16X ... We consider HubSpot's software to be a prerequisite for our customers' success. Offering inbound services allows your agency to build larger retainer agreements with your clients. As you show the ROI of your services, it'll be easier to incorporate new strategies and services into each client engagement. 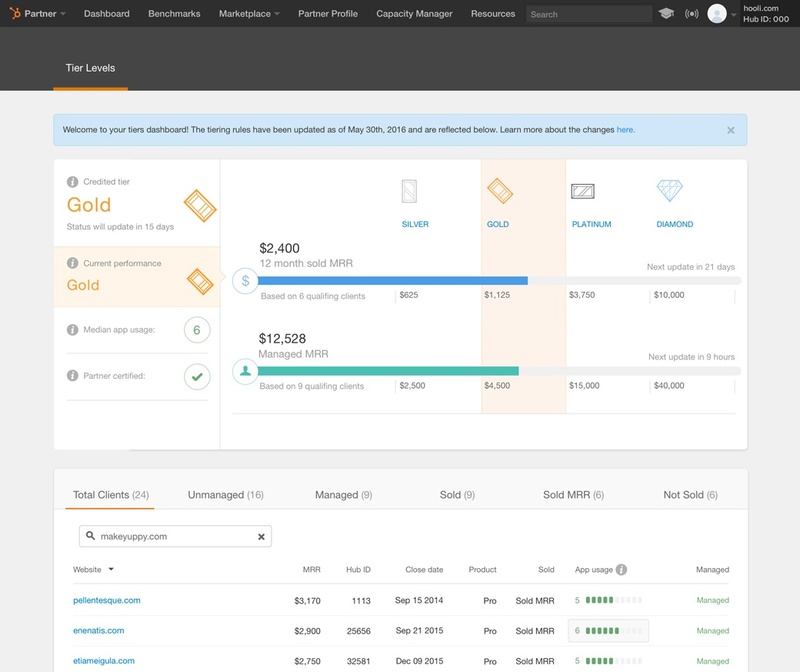 HubSpot partners have a clear view into all the data and reporting necessary to quantify their return on client spend — all in one place. To your agency, this means you’ll streamline internal processes and improve your operational efficiency. Offering inbound services enables your agency to clearly articulate the value you bring to your client. This enables you to offer repeatable services that keep clients engaged in recurring retainer services. Whether you’re a new agency or a seasoned pro, HubSpot’s Agency Partner Program helps you deliver value for your clients and grow your business — every step of the way. You’ll get HubSpot’s all-in-one software right out of the gate, but it doesn’t stop there. We’ll also set you up for success with the inbound marketing education and training you need to help you and your clients grow. And through HubSpot Academy, you’ll get exclusive partner resources such as our partner certification and a resource center full of marketing tools just for you. You don’t have to go it alone. A dedicated HubSpot channel consultant will help you successfully onboard and implement HubSpot’s software for your first three clients. For the duration of your HubSpot partnership, you’ll also work closely with your HubSpot channel account manager, who will provide in-depth business consulting with a focus on sales and revenue generation for your agency. Get exposure to more potential customers through your own listing in HubSpot’s agency partner directory, leverage the free marketing resources in our library, and get support from a dedicated HubSpot marketing consultant to help you generate more leads for your agency. Easily manage your clients using our client management tools and deliver ongoing services with the help of pre-made project templates and to-do lists built exclusively for partners — all while having an experienced partner support team by your side. With a partnership that goes far beyond software, your mastery of inbound marketing will enable you to show your clients real ROI so you can expand your offerings, build a repeatable process, and achieve better results. Get software discounts exclusive to HubSpot partners, become a certified partner, and work with your HubSpot channel account manager to build a plan to co-sell new inbound marketing retainer clients. As a HubSpot partner, you have an entire ecosystem at your fingertips to help support the growth and success of your agency and its clients. With over 150 HubSpot user groups across the globe, thousands of inbound marketing certified professionals, and a thriving online community, you’re never alone. As a HubSpot agency partner, you’ll join our community of thousands of approved agencies from around the world that offer a wealth of knowledge and powerful networking opportunities to help you scale your success. Team up with us, and join our active global community. Partner with HubSpot to power your agency’s growth. Become a HubSpot agency partner today and get an unfair advantage with our software, training, and support.